Dogs do not have it easy in the bright, glorious dollhouse worlds of Wes Anderson. Think of Buckley, beloved beagle of the youngest Tenenbaums, run down in the prime of his life. Or poor Snoopy, impaled casualty of the boy-scouts war raging across a woodland moonrise kingdom. (Who’s to say if he was a good dog, but he didn’t deserve to die.) To that kennel of unlucky pooches, pitted against each other for money or felled by poison blueberries, one can add an entire prefecture’s canine population. 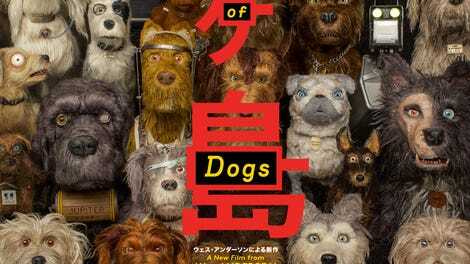 Isle Of Dogs, Anderson’s latest whirring, winning contraption of a comedy, is set 20 years in the future, predominately on a landfill in the Pacific, where an alarmed Japanese metropolis has exiled and quarantined every Rex and Rover, in order to contain the “snout fever” that’s afflicted the whole flea-bitten lot of them. What did dogs ever do to you, Wes? Pet owners can relax. Isle Of Dogs may strand mangy, sickly pooches on a floating garbage dump, even putting their furry hides in danger for the sake of a dark joke or two, but the apparent cruelty masks a deeper affection—a belief in the pure, undying loyalty of the species, around which this deceptively dog-averse filmmaker builds a fable about the disenfranchised. (Read the title faster if you doubt his true feelings.) But no stance on man’s best friend is necessary to get wrapped up in the endless wizardry of Isle Of Dogs, a gag machine with a characteristic tinge of melancholy that may well usurp Anderson’s last movie, The Grand Budapest Hotel, as his greatest visual and technical marvel—a movie whose every image is a miniature triumph of imagination and execution. Coauthored by Roman Coppola, Jason Schwartzman, and the actor Kunichi Nomura (who voices the film’s dog-hating heavy), this is another of Anderson’s madcap, clockwork capers, pausing its giddy forward plunge for moments of introspection. But though the plot leaps back and forth between a noir cityscape and a remote junkyard, while also spanning from ancient Feudal Japan (“before the age of obedience,” quips Courtney B. Vance’s narration) to the dystopian tomorrow, at center is a relatively simple boy and his dog story. Determined to find his canine bodyguard/companion, 12-year-old Atari Kobayashi (Koyu Rankin)—orphaned ward of Nomura’s corrupt mayor, who ordered the animals deported—pilots his miniature aircraft to the quarantine zone. Here, five chatty mongrels agree to guide him across the wasteland and help him find the lost, possibly deceased Spots. Meanwhile, on the mainland, a spunky, freckled American exchange student (Greta Gerwig) uncovers a vast corporate conspiracy. She’s the only human character who will be plainly understood by non-Japanese-speakers; the film’s quirky, casually complicated linguistic gimmick has the dogs’ barks “translated into English,” while much of the Japanese dialogue goes un-subtitled. Neither the bipeds nor the quadrupeds count as Anderson’s most richly developed characters. The most soulful of the pack is Chief (Bryan Cranston), a grouchy, coal-colored stray grappling—like Mr. Fox before him—with his wild side. “I bite,” he warns, but there’s a Humphrey Bogart wounded-romantic-type under all that standoffish bluster. Mostly, Anderson lays the heavy-lifting of character development on a typically star-studded ensemble of voice talent. Playing alphas nostalgic for domestication, Edward Norton, Bill Murray, Bob Balaban, and Jeff Goldblum have a field day with Anderson’s typically witty bon mots and bantering rapport, without emerging as personalities worthy of Rushmore Academy, New Penzance, or the house on Archer Avenue. Of course, the animators do their part, finding plenty of emotion swimming and tinkling in the giant, expressive eyes of these highly detailed puppets. It may hail from the same biological family as Fantastic Mr. Fox, but Isle Of Dogs is a different breed: weirder and more ambitious, darker in tone and starker in palette. Gone is the vibrant storybook look. In its place, Anderson erects a stylized retro-futuristic Japan, at once embracing the unreal quality of stop-motion (the vaguely, occasionally unnatural jerk of the movements; the swabs of cotton as smoke and the wrinkle of plastic as water) and reveling in the photorealistic detail of an animation style built on the manipulation of handmade objects. The ashen desolation of the central setting allows Anderson to dabble in a more muted, monochromatic color scheme than usual. But he also plays spectacularly with contrast, silhouetting his canine characters against pop-art towers of multi-colored trash or granting their sooty, patchy fur a relative luster against the apocalyptic grayness of the surroundings. It’s a movie that never stops astonishing you with its visual invention—the sense that an entirely imagined place has been brought to granular life. Unfolding across multiple chapters and flashbacks, Isle Of Dogs doubles down on Anderson’s affinity for literary devices and anecdotal detours. Is there a working filmmaker who finds more inspired ways to deliver plot information? He can make a priceless punchline out of a mere location stamp. The film’s cosmetic invention extends to its fluidly shifting visual vocabulary, as Anderson employs manga-style still frames during the expository prologue, anime-style 2-D animation whenever his characters appear on a television screen, and lush, painted tableau for backstory. One could argue that Anderson’s Japan is pure outsider kitsch, not unlike the exoticized tourist’s vision of India he offered in The Darjeeling Limited. But Isle Of Dogs doesn’t skimp on the cultural nods, offhandedly working in sumo wrestling, Kabuki theater, sushi preparation, samurai folklore, the woodblock work of Hiroshige and Hokusai, Akira Kurosawa’s chanbara and modern city films, kaiju-flick audio cues, and—through a typically propulsive, enchanting score by Alexandre Desplat—taiko drumming. If this is a superficial tribute, it’s also an affectionately dense one. Most accurately, what we’re seeing is an Andersonian alternate universe: a Japan as old and new, real and unreal, steeped in pastiche and invented from scratch as the brownstone New York of The Royal Tenenbaums. One might be inclined to dismiss Isle Of Dogs as “just” grand fun: one of Anderson’s meticulously crafted wind-up toys. (Certainly, it’s more gut-busting at a random, eventually freeze-framable glance than most American comedies are at their trailer-ending-punchline best.) But there’s a sneaky, timely resonance to this story of rising authoritarianism (fictional, as opposed to the real kind depicted in Budapest) and corrupt-government scapegoating of the marginalized and the powerless. “Brains have been washed, wheels have been greased, fears have been mongered,” promise the bad guys, and like most dystopian science fiction—a genre Anderson wears fashionably and drolly, as he does all things—the film feels as much like a cracked, fantastic vision of now as it does a prophetic prediction of later. You know things are bad when politics have begun to encroach even on the hermetically sealed biospheres of a Wes Anderson movie. Here, he finds a sliver of hope for the future in devotion—in loyalty and friendship and decency pitted against malicious intent. The dogs represent all that, which could be why they’re treated with a little more love than the average mutt to trot through one of Anderson’s neatly arranged, instantly identifiable frames.